Elegant marbled cheesecake with chocolate chip-studded chocolate base. 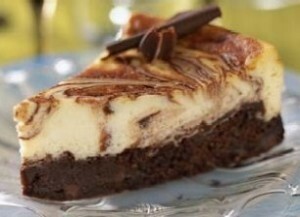 here is an easy dessert recipes for Double Chocolate Cheesecake. Preheat oven to 375°F (190°C). Line a 9-inch baking pan with aluminum foil, extended the ends over the edges of the pan. To make the chocolate base, beat butter, sugar and salt in a large mixing bowl using an electric mixer until combined. In a medium bowl, sift together flour with cocoa. Fold into creamed mixture; mix well. Press into the bottom of the pan. Set aside. For the filling, combine softened cream cheese, sugar, eggs and vanilla in a small bowl and beat until smooth and creamy. Divide in half and set aside. Sprinkle half of the chocolate chips on top of the dough in the pan, pressing into dough. In a small saucepan, melt remaining chips until creamy. Pour chocolate into half of the cream cheese mixture; blend until smooth. Pour chocolate-cream cheese mixture over crust then pour plain cream mixture over chocolate mixture. Using a spatula, gently swirl creating a marbled effect. Bake for 35 to 40 minutes or until the center is set. Remove from oven. Cool in pan on a wire rack for 30 minutes. Remove from pan and pull down foil to cool completely.